Candy Corn Water Beads - Halloween Vase Filler Idea! You are here: Home / DIY + Crafts / Candy Corn Water Beads – Halloween Vase Filler Idea! Everybody is using water beads this year to make crafts and DIY projects. Have you seen the fun YouTube videos?! 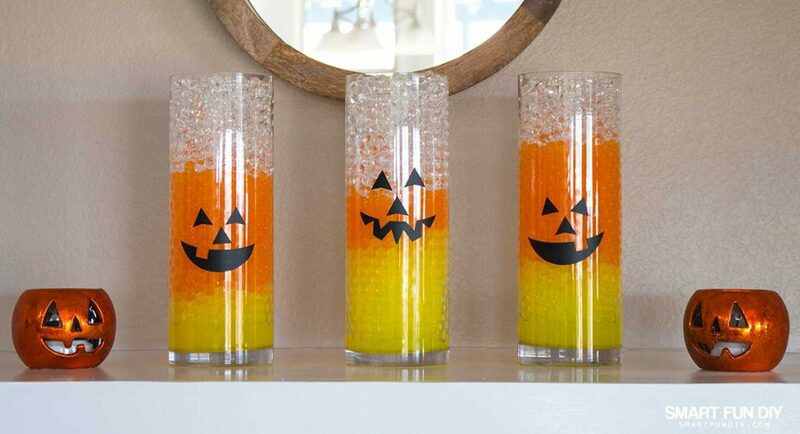 Water beads are super easy to use and are perfect for holiday decor, like Halloween. 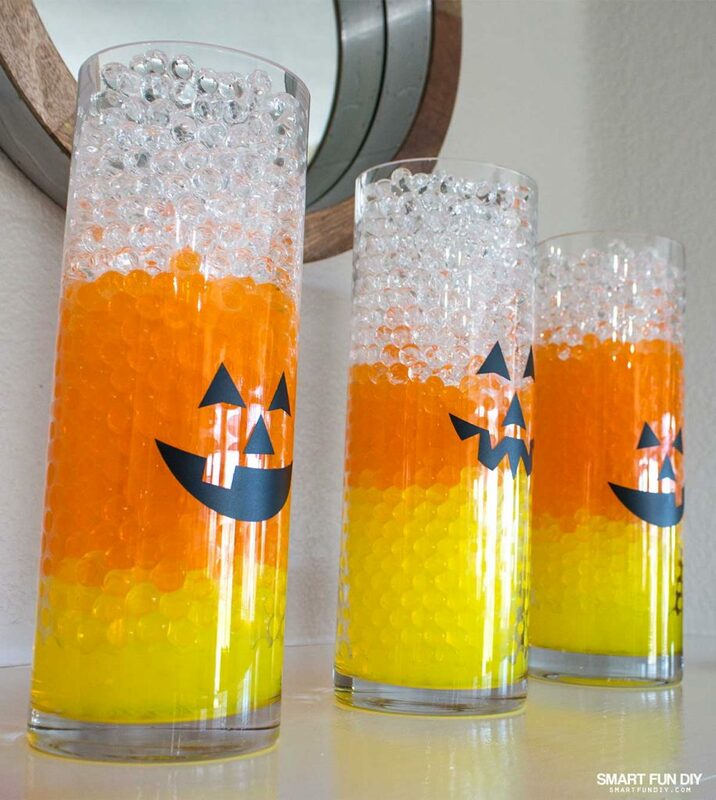 This Halloween season, it seems like candy corn is big trend so I decided to make a trio of candy corn inspired vases using water beads from Gemnique. With water beads, you can make any pattern or color combination you like and when the holiday season is over, you can dry the beads to store them for later. Now that's a smart DIY! 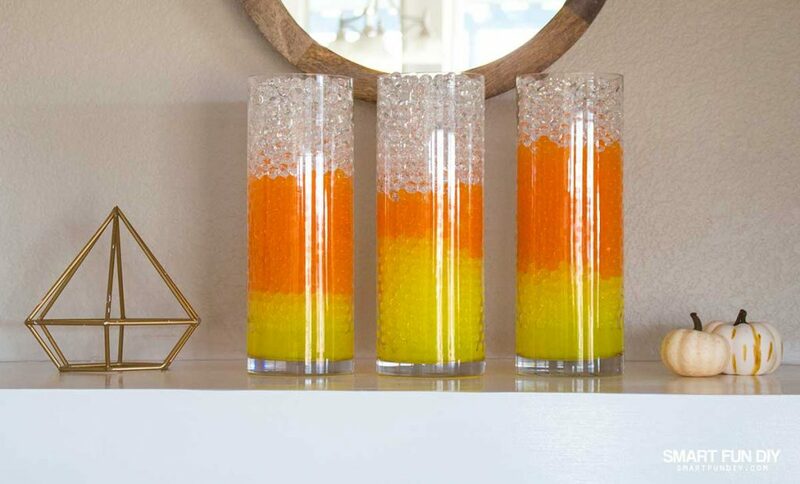 These DIY Candy Corn vases are filled with 3 colors of water beads for a unique Halloween vase filler idea. I picked up these vases on clearance at our local big box store but you can find vases like these at floral shops, online, and even at the thrift shop. If you love having fresh flowers delivered, another way to build up a supply of these vases is to always ask for a plain glass cylinder style vase with the flower delivery. This post contains affiliate links — when you click and get these supplies, the seller sends us a small commission. For these large, almost 18″ tall vases, I needed two packs of water beads to fill them. If your vases are smaller, you can probably use just one packet of each color of water beads. For larger vases, use more packets per color. I recently went looking for water beads at the craft store and could not find very much variety as far as colors and they definitely did not have the colors I needed for these candy corn vases. Amazon has the largest selection of colors, finishes, and sizes of water beads, glass gems, glass marbles, and glass shapes, including water beads from Gemnique (which I found to be the best ones). Gemnique’s factory produces smaller batch quantities which enables them to carry a wide variety of colors and sizes that cannot be found elsewhere. Water beads are popular for floral decorations, table/vase centerpieces, home décor and a wide range of other decorative projects. Because the packages are small and easy to store, you can experiment with many different colors without the worry of bulky leftovers. 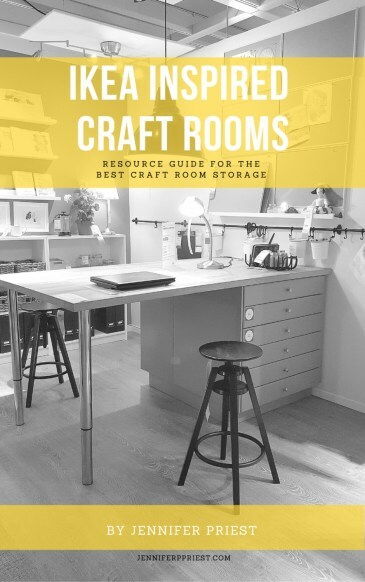 Try layering colors for a trendy effect, or mix colors to create your own design. After just a few minutes in water, the beads will already have doubled in size. 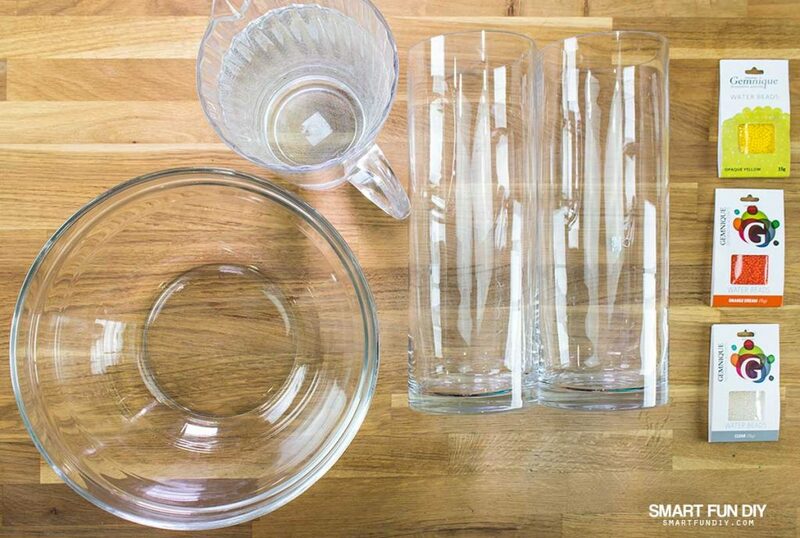 You'll need to soak the beads for 4-6 hours to get them to full size and you can make them even larger by using distilled water instead of tap water. To dry the beads for storage, lay them in one layer on a dry surface. It took about 5 days for the water beads I used for this project to dry out completely in our dry desert air. In the vase, they will last for weeks! If you start to see any shrinkage, add a little dash or spritz of water to keep the beads on top moistened. The water will seep down to the beads below, helping them all maintain their size. We started out by filling the vases with yellow water beads to different heights in each vase. You can also fill the vases each to the same height. 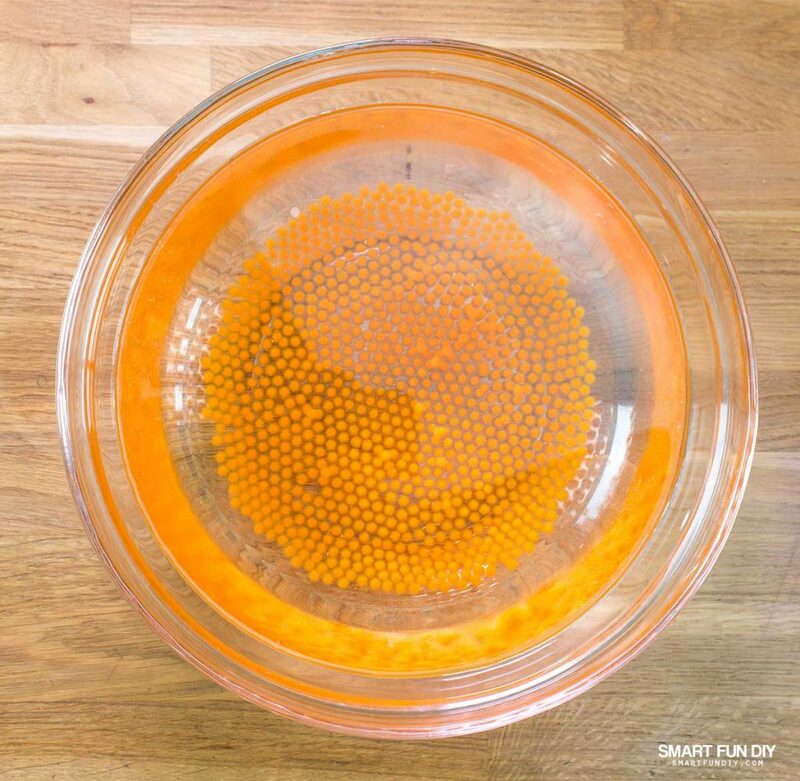 To add the second color, orange, you'll need to carefully place the orange water beads on top of the yellow water beads. If you pour the beads in from the top of the vase, they will bounce and press down into the yellow section of the vase, making an ombre effect. If you like that, then pour away! I wanted a distinct line between the yellow and orange beads so I gently added orange water beads until there was a solid layer of them atop the yellow section. Then I poured in more orange beads to fill each vase to the level I wanted. Finally, I added clear water beads, using the same method to keep them separated from the orange beads. The vases look great on their own, water beads catching and reflecting the light in the room but for more interest, I added jack-o-lantern faces to the vases using adhesive vinyl. To create the faces, I ran a sheet of adhesive vinyl through an electronic die cutting machine and then added the cut vinyl stickers to the vases. If you don't have an electronic die cutting machine, you can draw or print a design on paper, tape it on top of the vinyl, and then cut out the design using a craft knife or scissors. While the jack-o-lanterns are cute, I also love the typography and brush lettering trend right now. 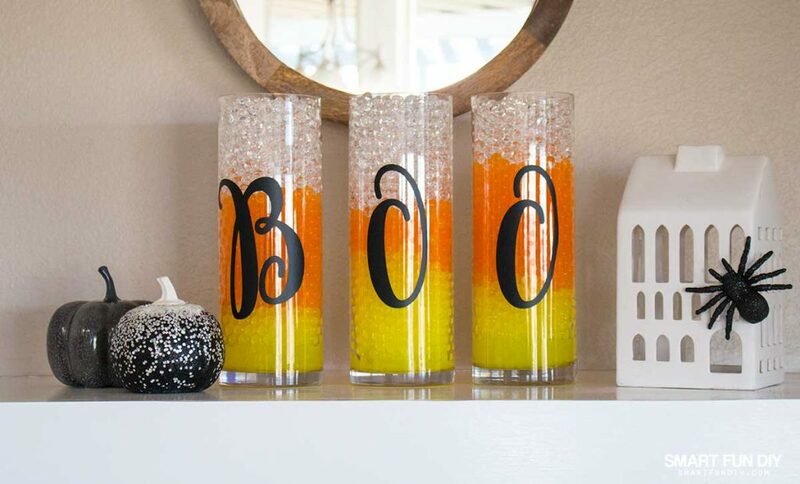 I cut the word “BOO” from vinyl and added one letter to the back of each vase. The font I used is called Freestyle, available from Creative Market. 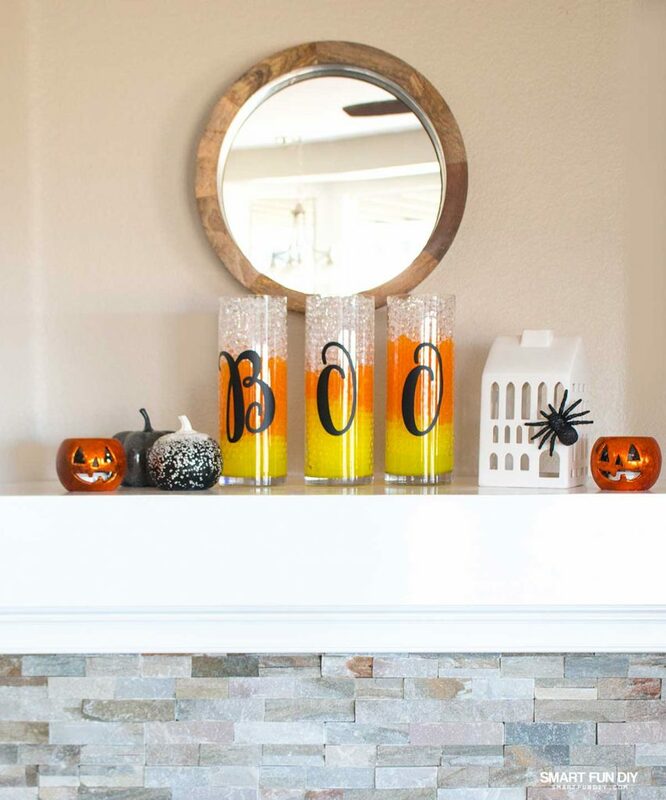 By turning the vases, I can have them display the word “BOO”, display jack-o-lantern faces, or even use two of the jack-o-lantern faces as the letter “O” in the word “BOO”. Add more vases to spell longer words, like “SPOOKY”! Display these vases on your mantle, in a window on Halloween, or as a centerpiece for your Halloween get together, like we this! 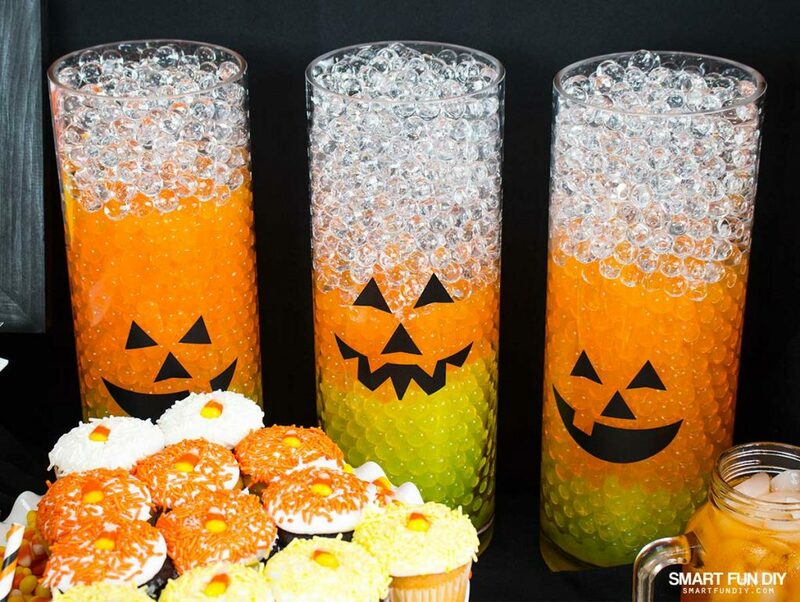 How would you use water beads to decorate this HALLOWEEN? Leave a comment to tell me what you'd do with water beads! My daughter is obsessed with water beads and I have my kitchen infested with them. I love the idea of dry them back to their original size because it is getting out of control! 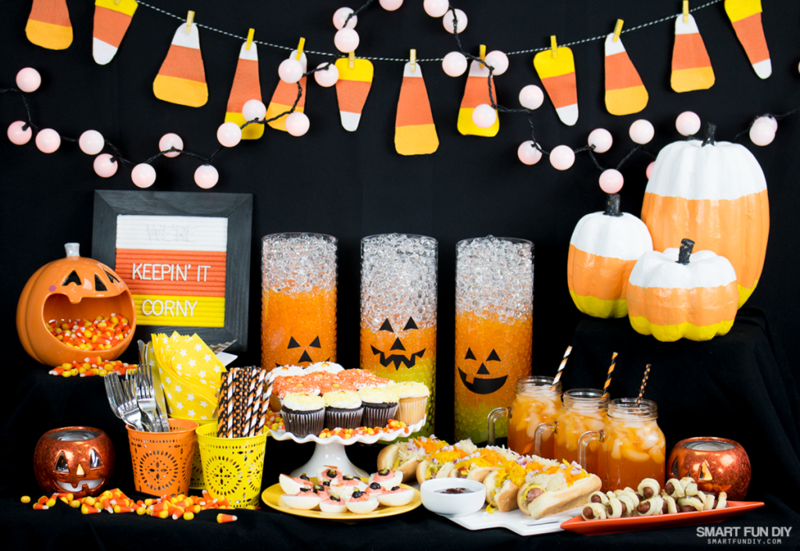 On the other hand, I love the candy corn vases idea. I will do something like it next year. This so adorable. And so easy. You can’t get much better than that.